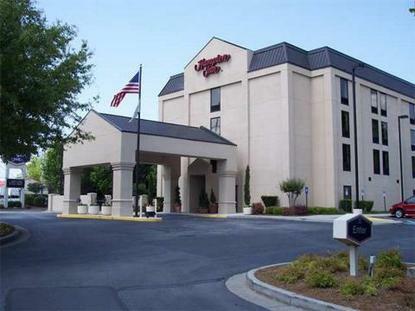 Hampton Inn Gainesville is located in the central business district, within walking distance of downtown. We are across the street from the Arts Council and 2.5 blocks from the Georgia Mountains Convention Center. Area attractions include Brenau University, Lakeshore Mall, an equestrian center, boating, skiing, fishing, golf courses, race tracks, and water parks. Within .4 mile you can dine at Henry O's, Lunas, Boiler Room, or Rudolphs. We feature 4-stories, 74 rooms, 2 elevators, interior corridors, outdoor pool, and complimentary passes to a local health club. Amenities include the new Make It Hampton Breakfast, free Wireless High Speed Internet Access, Voice Mail, and Cable with HBO. In each room we also offer hair dryers, irons and ironing boards, coffee makers and 27 inch televisions. Laundry/valet services are available for a nominal fee.